Overhead projectors work with the help of transparencies. All data are printed on top of the transparencies. Before starting up, be sure to have a socket with live electricity where you can switch the overhead projector. The power buttons are usually made of first class plastic, the “click” sound is heard; it means it has been successfully put “on”. If the overhead projector is not working, try to push the button more slowly, and you can feel the “click”. Inside the overhead projector, usually it is like a television, but the difference here is it has two mirrors. The machine has a bulb and a spare bulb. 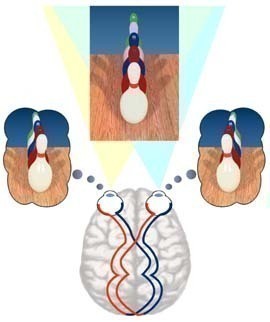 The bulb is use sends light beams to the first mirror, and the second mirror catches it, and leads it to a magnifying window at the last end of the path of light, this focuses the light to keep the data on the screen. Overhead projectors use the play of mirrors, like a telescope, but uses mirrors to project images and documents. 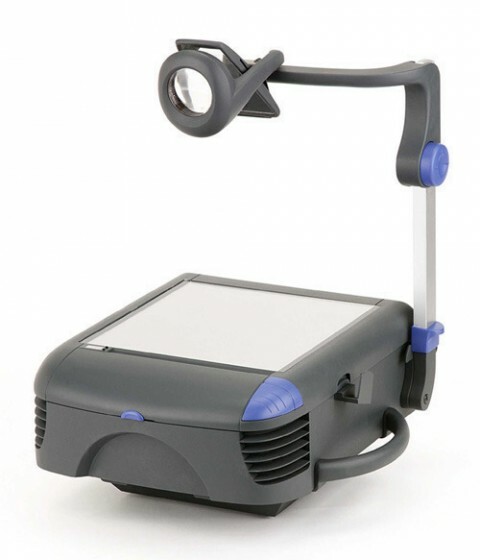 Overhead projector basically functions well because of the fan and a bright lamp inside the machine. If you notice, overhead projectors have a special long overhead; this is used in minimizing or maximizing the use of Overhead projector. Transparencies are placed on top of the second mirror, and when the lights are put on, it immediately projected at the screen of the lecturer. The light of the lamp travels between the two mirrors; the second mirror eventually reflects the transparency with information. An overhead projector can function very well, if the knobs are all in place, especially the plastic ones. 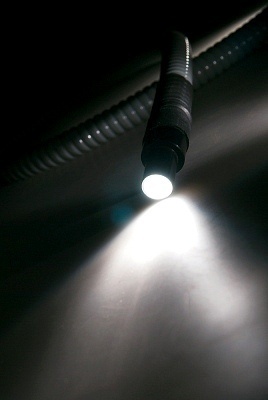 Most overhead projectors are kept firmly in box type cases to protect the bulbs and other parts from malfunctioning. The lens used in overhead projector is called the “fresnel lens”, the concept here is the optic works of a microscope and telescope. These lens are circular and focuses the light in one direction, here to an area of a reflecting mirror, then this mirror reflects the document on screen. The optics of the lenses usually inverts the images; if it doesn’t there is a need of another lens. 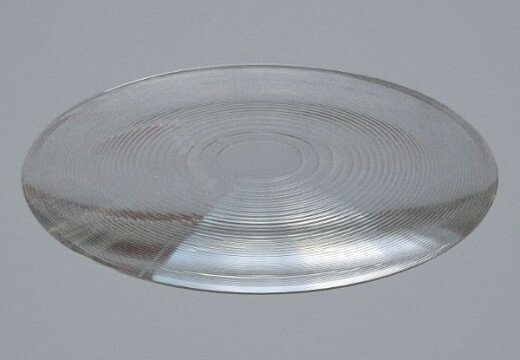 The lenses has a thick middle and the edges are thinner, or basically it is known as convex lenses. The bigger lens called objective lens is nearer the object, and makes it a smaller image in the scope, the picture or image is too small so the need of the eyepiece which will make it into a bigger image. There is a focal length on each lense on lenses. The formation of the image in different lenses, in such away that is is form away from the lenses. Digital projectors convert an analog or digital video signal into a corresponding image on a projection screen using a complex assembly of lens and high intensity lighting. Digital projectors rely upon a very bright light to project the resulting image on the screen. Modern projectors can smooth any curves, reduce blurriness, and offer increased sharpness, all hallmarks of digital technology. Digital video projectors have extensive use in a variety of places like conference room presentations, classroom training, and home theatre applications. The quality of the projected image is measured in pixels. Termed as resolution of the image, higher the pixel count better is the picture appearance. Digital projectors commonly project in SVGA (800×600 pixels), XGA (1024×768 pixels), 720p (1280×720 pixels), and 1080p (1920×1080 pixels) display resolutions. A digital projector is judged by its light output, acoustics, contrast, and a few other characteristics. Small projectors (rating of 1500 to 2500 ANSI lumens or lower) provide sufficient light for small screens at night or under controlled lighting such as in a basement with no windows. A larger screen or a room with more ambient light requires a projector with a high (between 2500 and 4000 lumens) light output. Over 4000 lumens is suitable for large screens with no lighting control, as in mini theaters. Projected image size is important because the total amount of light does not change. As image size increases, brightness decreases. Image sizes are usually measured in linear terms, diagonally, neglecting the fact that larger images require more light (proportional to the image area and length of a side). Increasing the diagonal measure of the image by 25% reduces the image brightness by 35%. Correspondingly an increase of 41% reduces brightness by almost 50%. CRT (Cathode Ray Tube) digital projectors operate along the same general principles as CRT televisions. There are three main configurations for CRT digital projectors: the projector may have one RGB (red, green and blue) color tube with a single lens, one black-and-white tube with a rotating color wheel, or three RGB color tubes with three lenses. In all these configurations, an image is produced at a relatively small size ranging from six to twelve inches (15-30 cm), and then magnified with a lens onto a large screen. 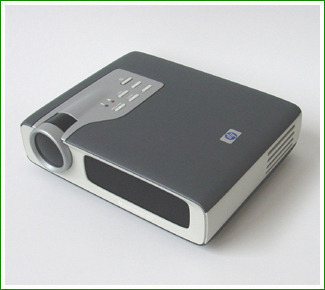 CRT digital projectors are quite bulky and heavy, making them suitable mainly for fixed locations. Digital LCD projectors use LCD light gates. This is a simpler system, making it popular for home theaters and businesses. LCD Digital projectors have been developed which have very clear and crisp fidelity even at large projection sizes. The LCDs used in digital projectors are approximately the size of a small color slide. The main difference is that the slide is constantly changing. Drawbacks include a visible “screen door” or pixilation effect. DLP (Digital Light Processing) projectors use use one or more microfabricated light valves called digital micro-mirror devices (DMDs). These digital projectors have an array of tiny mirrors, one for each pixel. As these mirrors reposition themselves to either place light on the screen or not, they produce shading which creates the illusion of a complete image. DLP technology is used in theaters as they make the transition to digital projectors, due to its extremely high quality and fidelity and its lack of pixilation even at high image sizes. Systems with 3 DMDs never have pixilation problems, as they display each primary color simultaneously. Some other available projector technologies include, LCOS projector using Liquid crystal on silicon, Direct-drive Image Light Amplifier based on LCOS technology, and LEDs using an array of Light Emitting Diodes as light source. The future for digital projectors is bright, with new technologies constantly being developed. As more and more theaters switch to digital projection, consumers cannot help but reap the benefits. As these technologies become more affordable they will inevitably find their way into home systems and allow each of us to experience the joy of a full theater projection in our own home. 158 queries in 0.335 seconds.